If your platform is the Windows 8 early edition, use Microsoft Office on your mobile smartphone or iPhone requires this App. • Cloud - You can access Office files stored on OneDrive, Business OneDrive, or SharePoint on your phone. 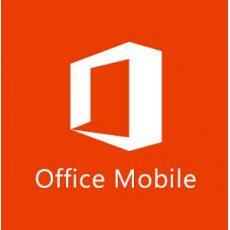 • Recent files - Office Mobile connects to the cloud repository. Locate the Recent Files panel on your phone to use the files you've recently viewed on your computer. • Beautifully presented files - Supports charts, animations, SmartArt graphics and patterns to give Word, Excel and PowerPoint files a beautiful look on your phone. • Designed for mobile phone interface - with mobile phone screen size, the perfect presentation of Word, Excel and PowerPoint files. • Continue reading - When you open Word files from OneDrive or Business OneDrive on your phone, you can automatically start from the last location even if you last viewed the file on your computer or tablet. • Presentation View - PowerPoint's "Slide Tour" view makes it easier to navigate slides more quickly, and the speaker's notes help rehearse presentations. • Keep files intact - Format and content remain intact when editing Word, Excel, and PowerPoint files on your phone. • Create - You can create new Word and Excel files on your phone. • Annotations - You can view annotations in your Word and Excel files on your phone and add annotations yourself. * Create, edit, and save your home files with a free Microsoft Account login. A qualified Office 365 subscription is required to create, edit, and store business documents. A list of eligible solutions can be found at office.com/information. Requires Android OS 4.0 or later (Android M is not yet supported). For more information, please visit: http://www.office.com/mobile. When you check out this order, at the last form entry, be sure of writing correct email box to let us send.